1. Related Content: On a per content basis, there is a Related Content box that displays similar content. 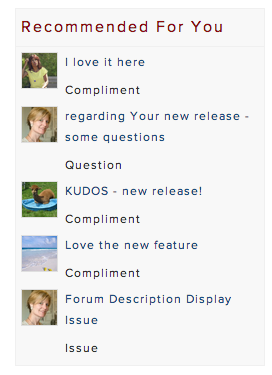 For forum or QuestionShark topics, we display these recommendations in the right sidebar, but for other content types, we display the recommendations directly below the content body. As an admin, you can utilize the new Recommended Content widget. If you add it to your site, signed-in members will see the widget and the content in the widget will be personalized per each viewer, reflecting content specifically recommended for them. This is great way to increase engagement on your site. When you view a member's profile on your site, you will see a "Similar Members" box that displays members that have some similarity to that member. NOTE: Admins can also control whether they want to display both recommended content and/or members, in the new Recommendation Engine control panel, which is a submenu under Manage Content in your Admin Control Panel. Note: the new Recommendation Engine feature is available as a plan add-on for Pro plans only. Do I have to pay extra for this? It looks useful but surely based on the monthly fee this would be a normal integration as part of the development of the site? We currently do not show any related content on the mobile interface.